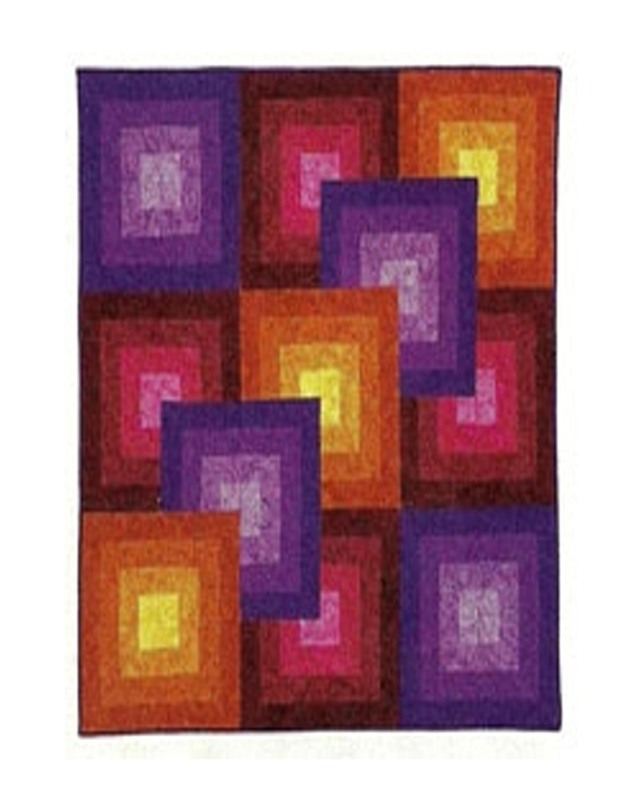 I so http://www.quiltershomemag.com/patte...html?idx=13608 want to make this quilt . But I don't know how to make it longer without losing the 3D effect. I think you would need to add another row to the left and bottom. This would continue the 3D effect. One easy way would be to add borders. I would use 1-3 of the colors in the quilt. Changing to 3 1/2" strips would increase the size by 1.5. Strip lengths would increase to 6.5, 9.5 and 12.5". I believe the yardage requirement would increase by 4x. Changing to 4.5" strips would increase the size by 2x. Strip lengths would increase to 8.5, 12.5, and 16.5"
I'm with Joyce888, though, to increase the size, add another column and row. Last edited by charsuewilson; 05-23-2013 at 10:55 AM. If I add to both the bottom & left won't it still be a square. I want it to be rectangular. I've seen some photos posted in this forum of that quilt. lovely. You could draw out rectangles in EQ7, and see what it looks like. Otherwise, the only way would be to add borders unevenly, e.g., one on the side and two or more wider borders on the bottom. One more thought. Try printing out 2 copies of the picture in the pattern. Then try overlaying the pictures. The first thing I tried was to take the top row to the bottom, but then the red is next to red. Then I tried pasting the 2d and 3rd row to the bottom. But then there is a partial purple next to purple. But if you change the original bottom right to orange and keep the whole partial purple -- take the copy, leave the orange in the upper right, the purple half in the top row, then cut out the rest of the top row, and paste that over the bottom row of the original. That will give you 2 diagonal rows of the optical illusion. The quilt will be 3x5 rows. PM me if this isn't clear. The red square in the middle would have purple in the upper left and lower right corners. If your library has a copy of StrataVarious Quilts by Barbara Persing & Mary Hoover, they have a couple layouts of a similar idea in their book. I know they use a different technique & placement of colours but it might give you an idea on how to turn it into a rectangle. Last edited by thimblebug6000; 05-23-2013 at 11:52 AM. I just finished this quilt, and I made mine larger by adding borders. It is still square though. It ended up being 61 inches square. I added a two inch inner border and a five inch outer border. I know that isn't what you are wanting to do, but perhaps it is a starting spot. If you made the top and bottom borders bigger...well, now I can't visualize that either, but...there ought to be a way to do it. Dina, I see yours has passed inspection. 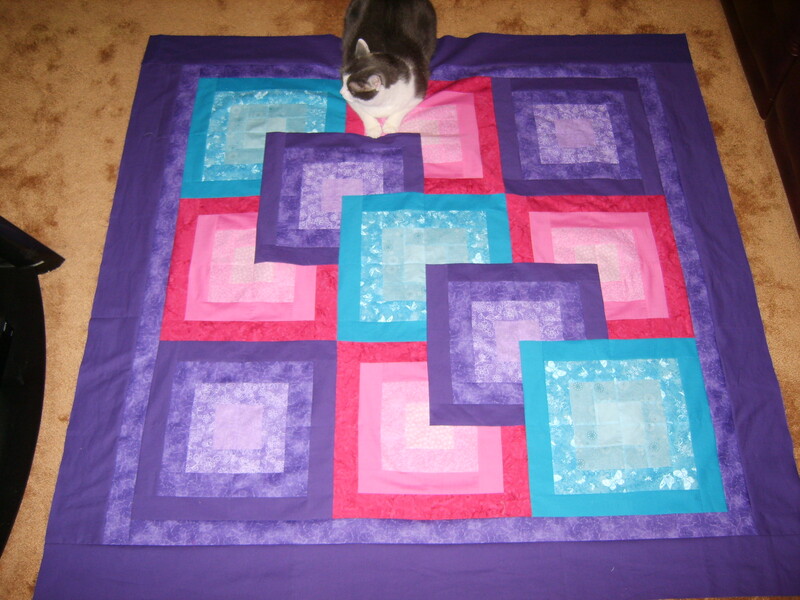 Yes, Hot Rod, my 16 pound quilt inspector, has to approve every quilt I make! His idea, not mine. Going away for weekend, so have to put this away. I've just tried making several color copies. Cutting the blocks apart & adding another row. Almost worked,of course I'm almost cross eyed. Your suggestion makes more sense, start all over again. Wow, adding borders looks great. I assumed I couldn't do borders. Redrafting for rectangles would be my solution. I love the added borders. My daughter made this quilt a couple of years ago. She said it was really very easy. I like the idea of adding borders to make it larger. 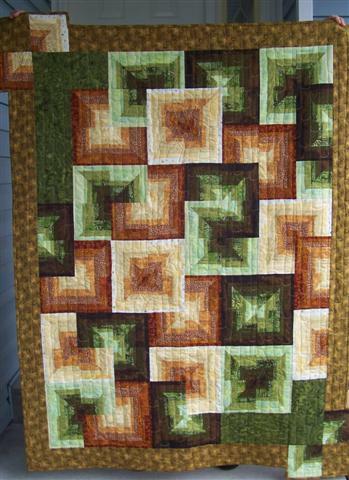 It would frame the 3D effect of the quilt as is. This is a Karen Combs pattern. She has several books out. Check those and see if she has a pattern that is rectangular. An easier way to do it would be to change the design from squares to rectangles. It would be fairly easy to elongate the quilt that way. Would mean redoing the instructions, but it wouldn't be that hard to do. You still get the 3-D effect. I really like the way Dina done hers. You could just add thinner border all the way around & then another thin border on the sides & a wider top & bottom border. That would make it longer & would really frame the blocks & make them pop.